Some gems, like turquoise, are highly coveted but rare to find, much less in the sizes and quality people dream of owning. Laboratory created jewels offer you the best of both worlds. You get the beauty of a beloved gemstone, but at a budget friendly price. The term synthetic refers to a man-made material with a natural counterpart. The synthetic material replicates the chemical, optical and physical properties of the natural version with little or no variation. 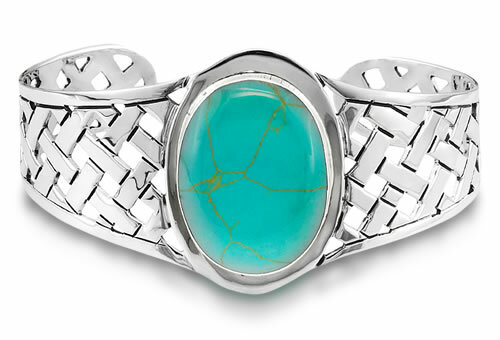 Synthetic turquoise has tiny blue microspheres that give it a "cream-of-wheat" appearance. Stones might have blue thread like inclusions and artificial black matrix that is even with the surface.